Read The Xfm Top 1000 Songs Of All Time, compiled by the Xfm team and experienced music journalists, including Tom Bryant. 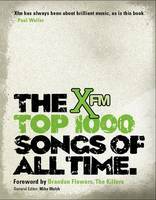 The Xfm Top 1000 Songs Of All Time is the definitive guide to music, written by the people who really know. Pieced together by the radio station and top music writers, it explains all the hidden stories, inspiration and scandal behind the world’s best music. With a foreword written by The Killers’ Brandon Flowers and extensive interviews throughout, it is a must have for music fans.